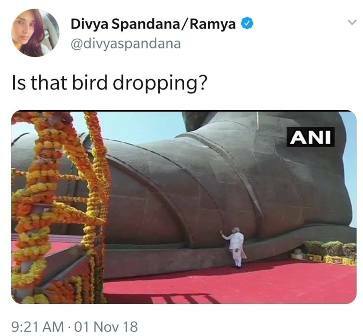 ONI Bureau: Congress IT Cell Head Divya Spandana (Ramya) courted controversy yet again when she tweeted a distasteful comment against Prime Minister Narendra Modi comparing him to “bird dropping” drawing flak from netizens and senior journalists. However, Divya Spandana remained unfazed and defiant and accused the critics of trying to distort her tweet without offering any explanation or clarification. There has been a massive outrage as Divya hit a new low while attacking PM Modi. “Ummm no, it is the values of the Congress that are dropping. Historical disdain for Sardar Patel + Pathological dislike for @narendramodi = Such language.